The 1970s may have been the most miserable decade in recent memory, a decade of gasoline lines, jobless queues, rampant inflation, and international instability. 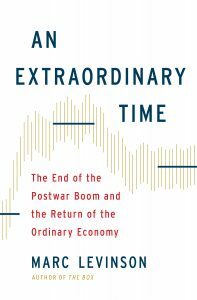 An Extraordinary Time takes a fresh look at this period from an economic perspective, and develops a new understanding of why, in the late 1970s and early 1980s, countries around the world embraced free-market ideas that had been in disrepute for half a century. The years after World War Two, beginning around 1948 and lasting until 1973, were, as the title suggests, an extraordinary time, a time of remarkable improvement in living standards in every wealthy economy. Unemployment was very low. Inflation was under control. New homes sprouted by the tens of millions, and rapidly expanding universities opened their doors to the children of average working families. A growing welfare state provided income security, offering old-age pensions, disability benefits, unemployment insurance. Year after year, people could feel their lives getting better. Economists promised that economic volatility was a thing of the past. Thanks to computers and fancy quantitative tools, they claimed, governments now had the ability to provide jobs for all and keep recession at bay. And then, at the end of 1973, the dream fell apart. Boom turned to bust almost overnight, and worries about shortage of workers and raw materials vanished amid a global recession. Unemployment rates soared. So did inflation. Japan, the United States, Canada, and Western Europe all faced unexpected economic crises. The spike in oil prices in October 1973 was widely blamed for these problems, but there was a much deeper cause. Improvements in productivity–the efficiency with which economies make use of labor, capital, and technology–all but stopped. This was a problem governments could do little about, leaving voters around the world angry with politicians who could no longer fulfill their promises of full employment and steady economic growth. In one country after another, the public mood turned against big government and toward leaders who promised to cut government down to size–Margaret Thatcher, Ronald Reagan, Helmut Kohl, and others. But the conservatives proved no more successful in restoring rapid growth and full employment than the less market-oriented politicians they supplanted. The reason, I argue, is that the postwar miracle was made possible by circumstances that will never recur. The world economy did not collapse; it turned to normal–a situation in which incomes grow slowly and living standards improve at a gradual place. Public expectations are far greater than what political leaders can deliver. The initial comments about An Extraordinary Time have been very kind. Alan Blinder of Princeton said the argument is “artfully presented, and largely persuasive,” and Dartmouth economist Doug Irwin said it “helps put our current economic difficulties in perspective.” I hope you’ll enjoy the book. From modest beginnings as a tea shop in New York, the Great Atlantic & Pacific Tea Company became the largest retailer in the world. Under the leadership of the two men who controlled its shares, the flamboyant John A. Hartford and his reclusive brother George L. Hartford, A&P transformed America’s archaic retail sector. A&P integrated vertically, opening canneries, dairies, and plants making everything from ketchup to cocoa, becoming the country’s second-largest baker, and importing more coffee than any other company. Its manufacturing plants fed its stores through company-owned warehouses, allowing A&P to circumvent wholesalers — and to avoid paying wholesalers’ commissions. 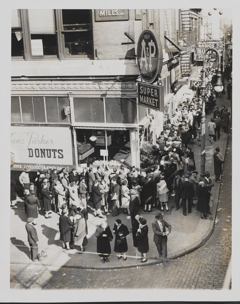 A&P’s strategies dramatically lowered the cost of distributing food, and its low prices brought customers streaming through its doors. By the end of the 1920s, A&P had become a juggernaut, the first retailer to sell $1 billion in goods, the owner of nearly 16,000 stores. A&P’s explosive growth made it a mortal threat to hundreds of thousands of mom-and-pop grocery stores and the wholesalers and manufacturers who supplied them. Main Street fought back tooth and nail, enlisting state and federal governments to stop price discounting. The administrations of Herbert Hoover, Franklin Roosevelt, and Harry Truman investigated A&P. State after state passed laws imposing taxes on each store owned by a retail chain, laws that hit A&P far harder than any other retailer. Many states required stores to set their prices at least a specific percentage above wholesale, so small retailers would not be hurt by low chain-store prices. Federal laws took aim at volume discounts, and Congress even considered a chain-store tax that would have stripped away A&P’s profits. In a remarkable court case, the federal government pressed criminal charges against the company for selling food too cheaply – and won. After the Hartfords’ deaths in the 1950s, A&P soon began to crumble, falling victim to the very competitive forces it had helped to unleash. In telling the story of its rise and fall, The Great A&P and the Struggle for Small Business in America explores the longstanding tension between capitalism and competition in the American economy, a tension that remains very much with us today. The Great A&P was warmly reviewed by The Atlantic, which found it “clear and compelling,” and by The Wall Street Journal, which named it one of the ten best nonfiction books of 2011. Interviews about the book ran on the National Public Radio programs Fresh Air and Morning Edition. Seattle Times reviewer Roger K. Miller called it “a superb business study and an entertaining read.” In The New York Times, Harvard Business School professor Nancy F. Koehn described The Great A&P as “absorbing,” adding, “It is more than a rich business history; it is a mirror to our own conflicting wants and visions of who and what we should be.” You can read her review here. In The New Yorker, James Surowiecki discussed The Great A&P in a thoughtful article arguing that while politicians invariably praise small business, big business is actually more important for economic growth. On April 26, 1956, a crane lifted fifty-eight aluminum truck bodies aboard a refitted oil tanker in Newark, New Jersey. Five days later, the Ideal-X sailed into Houston, where fifty-eight trucks waited to haul the metal boxes to their destinations. This was the beginning of a revolution that made the boom in global trade possible. Before the container revolution, the high cost of moving goods was a major impediment to international trade. 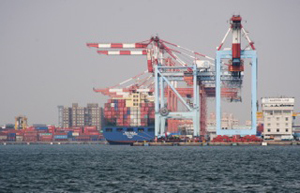 The container changed that, driving down transportation costs and in the process reshaping economic geography. The Box tells the dramatic story of the container’s creation, the decade of struggle before it was widely adopted, and the seismic shifts it helped bring about — shifts with far-reaching consequences for workers, communities, and the international economy. The Box was shortlisted for the Financial Times/Goldman Sachs Business Book of the Year award, and was honored with a number of other awards and prizes. It was selected as one of the best business books of 2006 by Business Week, the Financial Times, and the Globe and Mail, and was cited as one of the best business books ever in the New York Times. Bill Gates named it the best book he read in 2013. It has been translated into several languages. 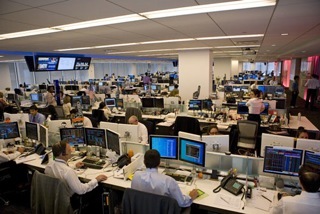 The credit crunch and ensuing financial crisis brought home to everyone the enormous influence that financial markets exercise and highlighted the pace of innovation in finance. 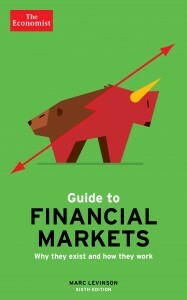 The Economist Guide to Financial Markets, now in its sixth edition, is designed to help non-specialist readers understand why financial markets exist and how they work. Written in non-technical language, this is a useful guide for anyone wishing to understand currency trading, stock and bond markets, securitization, and futures and options markets.